'The sleepy sun was just making his first attempt to pierce the early morning mist as the 3rd Battalion silently slipped out to attack Eindhoven. They had the tough assignment of frontal attack and caution was the byword as they moved carefully to avoid any ambush. The leading scouts explored every possible gun position thoroughly and it wasn't until they had advanced a short way into the suburbs of the city itself that sniper fire began picking at them. Deploying into attack formations the battalion continued to advance, using bazookas extensively to set sniper nest in barn and houses afire. Then we hit their MLR (Main Line of Resistance). And how! The battle now resolved itself into a series of sharp skirmishes with small groups stabbing at the enemy lines for weak points and, once finding them, slipping in and really raising hell with the defenders. The advance was very slow now and two 88's were making the main road into town a shambles and any advance up it out of the question until they were knocked out. Then came the kidney punch. The 2nd Battalion made a wide sweep to the left and smashed into the kraut's right flank rolling it up like an old rug and practically putting an end to all resistance. The 3rd Battalion then cleaned out the krauts to their front easily since the 2nd Battalion had knocked out the two troublesome 88's holding up their advance. By 17.00 on the 18th of September 1944, Eindhoven had fallen completely to the 506th Parachute Infantry Regiment, to become the first Dutch city to be liberated'. 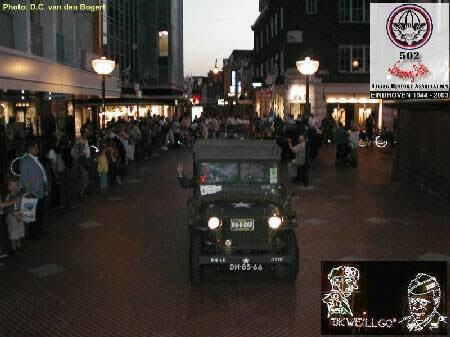 In the early morning of September 18th, 2003, we set for Eindhoven once again with our vehicles. We did not follow the main road but decided to extensively tour The Island region. So we passed Heteren, Randwijk, Opheusden and the many other smaller villages with names that are engraved in US and English history forever. For in this very region the battle raged for months, following operation Market Garden. In the afternoon we linked up with the Wheels organization, in charge of the Eindhoven Liberation Tour once again. This time 50 historical vehicles were chosen out of hundreds, to enter the main 'defile' into the city, ending up at the monumental square, for a drive by in honor of the veterans, present again. Among the vehicles a true heavenly variety of GMC's, Dodge Weapon Carriers, a DUKW, a Dingo, a Halftrack with a Quad .50, Jeeps of various types and 'seasoning', Command Cars and even a Dodge '42 pick up. Accompanied by English and American built motorcycles we started heading for Eindhoven following the main road through Valkenswaard. People along the road, flags, cheers and lights. For this is always a celebration of light & liberation! The city of Eindhoven, known as the 'light'-city of Holland, is decorated with hundreds of ornaments, and until October people can choose to walk or drive a special route through the city. At the set time and place we dropped off the youthful passengers and wished them well. Then we lined up again and made our way into the heart of the city; bells of all churches ringing and thousands of people lining the road now. We actually had anticipated lots of people and had stacked lots of candy for the youngest amongst them, which was very much appreciated. Near the square pace was slowing down as the vehicles were introduced by an official speaker. As 502nd Parachute Infantry Regiment Living History Association, we were proud to drive along the veterans, guests and other officials. Why? 'Our' boys liberated this city a day after they had jumped into Holland. In honor of men like Major Horton (506th PIR) and Joe Mann (502nd PIR), KIA in Holland. Remembrance brings us all together, young and old, domestic and foreign, men and women. And the Torch will be carried by many generations to come. We will never forget their efforts! Special thanks to the Wheels Organization, giving us the opportunity to team up with them once again.